Purple Turtle makes world's first LIVE satellite broadcast from Victoria Falls. 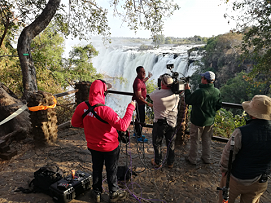 Victoria Falls, Zambia, September 2018: Purple Turtle Communications and SNG based in Port Elizabeth, South Africa had the pleasure of recently working with a premier UK morning show to bring the world's first LIVE satellite broadcast from the very edge of the Victoria Falls in Zambia to form part of the incredible morning TV programming. July saw the Falls being at its highest water levels making for spectacular vistas with the falls in full flow. This also posted a challenge as the mist from the falls blows in different directions based on the wind and becomes a torrential downpour, which is challenging for electronics and satellite links. In the end the site was selected and tested and the day's broadcast kicked off with mind-blowing live shots showing how big the falls are, reducing the presenter to a mere pixel when the shot was zoomed out. Purple Turtle Communications has been supplying broadcast-based solutions and SNG services in Africa since 1998 and are ideally positioned to offer a personalised hands-on solutions that works simply. To find out more, please visit: https://www.purpleturtle.co.za/broadcast/sng-satellite-uplink-and-broadcast-services-southern-africa or Call or WhatsApp us on +27 83 654 0932.